"A reader lives a thousand lives before he dies...The man who never reads lives only one." The English Department is situated on the ground floor of the school building in close proximity to the School Library. The department enjoys close links with Library which is led by a professionally trained librarian who has curated an attractive collection of popular classic novels and contemporary titles to appeal to all reading tastes. Every classroom is equipped with Apple TV and a Promethean Interactive Whiteboard through which a wide range of specialist software can be accessed. Thinking Skills and Personal Capabilities at the same time. 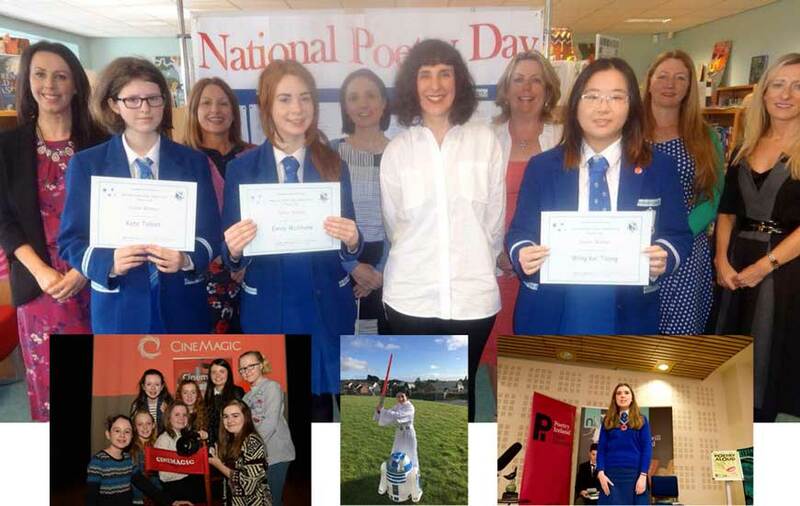 Students have many opportunities to work with external agencies and the department annually hosts events with visiting poets and writers who come to the school to inspire and share their subject knowledge with the pupils. Our English students frequently enjoy success in many external competitions and engage in enrichment activities ranging from Public Speaking to Filmmaking, Poetry Reading and Creative Writing. Students are encouraged to read for pleasure and they will be introduced to a range of enjoyable and challenging novels at Key Stage 3 to help develop their reading tastes and engage with the world around them. In addition to the class novel, there will be many opportunities at KS3 to study a wide range of non-fiction, poetry, media and drama texts. The Junior Drama Festival is one of the highlights in the school calendar and it gives all our budding actors the opportunity to showcase their talents on stage. Each class will have the opportunity to partake in Class Heats, during which finalists are selected for the Grand Final which is judged by an external independent adjudicator. Environmental Youth Speak Public Speaking competition, Patrick Kavanagh Poetry Award, Cinemagic Young Filmmaker, Royal Mail Letter Writing Competition, National Poetry Day Prize, Summer Read competition, World Book Day Awards, Arts and Minds Diversity Creative Writing competition and YAFTA (Youth and Future Talent Award) for Innovation and Creativity. The English Literature course aims to encourage students to enjoy the world of fiction and to read, understand and respond sensitively and perceptively to a wide range of literary texts. They learn to appreciate the ways in which authors use language to shape meaning and develop the sound analytical skills required for literary study. Through detailed exploration of prescribed texts, students come to understand the impacts of the social, historical and cultural contexts in which the texts were written, as well as their contemporary relevance. GCSE English Language provides opportunities for students to demonstrate their skills in Speaking, Listening, Reading and Writing which are necessary to communicate with others confidently and effectively. There are many opportunities for the pupils to express themselves creatively and imaginatively and to become critical readers of a wide range of texts. As well as developing their own skills as writers, pupils also gain a greater appreciation of the patterns, structures and conventions of written and spoken English and how these can be adapted to suit a range of purposes and audiences. Enrichment Activities: Students are encouraged to read for enjoyment and relaxation as a way to switch off from their busy schedules. A Middle School Book Club meets each term so that students can read for pleasure and recommend titles to their peers. 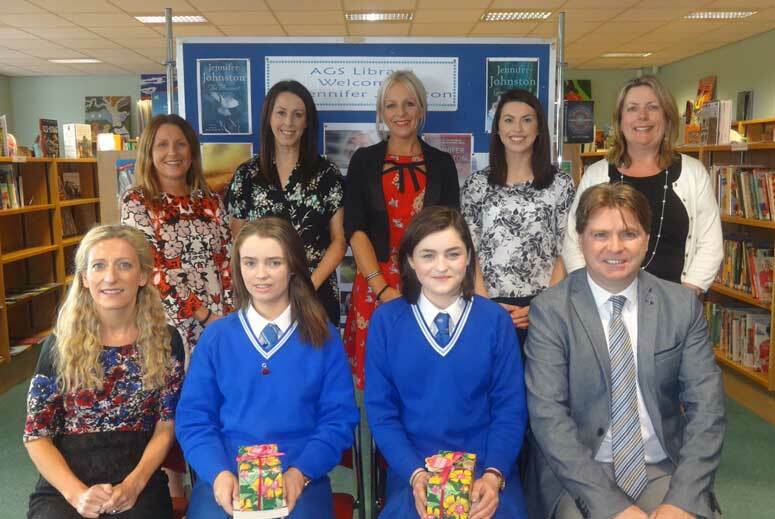 Students enjoy opportunities to review novels for panels such as the Guardian Young Critics and they are also encouraged to pursue their interests in writing by submitting entries to a wide range of external poetry and creative writing competitions. 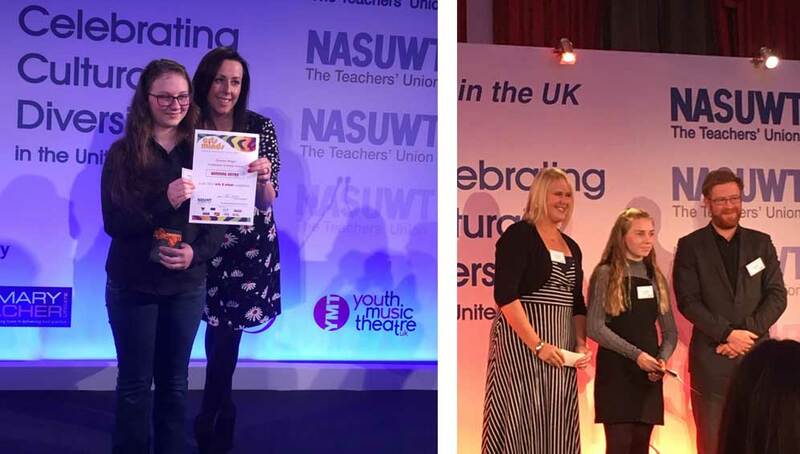 Two students were recent winners in the National NASUWT Arts and Minds competition with winning entries on the theme of ‘Diversity’. They travelled with their parents and teachers to London to receive their prizes at an award ceremony. Direct link to CCEA GCE English Language resources. English Literature at A Level will give students the opportunity to study a wide range of literature texts and explore the contexts in which these were written. Students will be challenged by what they read and enjoy opportunities to debate issues and develop their analytical and critical thinking skills. Students who study English Literature will develop the ability to articulate creative, informed and perceptive responses to text as well as refine and hone their verbal and written communication skills. Students answer two questions, one from Section A and one from Section B. Section A is open book. Section B is closed book. Students answer two questions, one from Section A and the question set in Section B. Students complete a 2500-word essay.